No fall and winter wardrobe is complete without a few corduroy pieces in the mix! The moment seasons officially change and the outside temperatures dip lower, we can finally whip out fabrics like velvet, sherpa, cashmere and yes, corduroy. Dressing for the colder months is so much fun because there are so many different designs and warmer textures to play with. We especially adore corduroy because it is such a casual texture that keeps Us warm when we wear it. We already began stocking up on skinny corduroy pants from our favorite retailers since early this fall. Now the Shop With Us team has spotted a pair newly marked down at Nordstrom! See it: Scoop up the Kut from the Kloth Diana Stretch Corduroy Skinny Pants (marked down 25 percent off their original $70, now $50) while so many sizes and colors are in stock. Kut from the Kloth Diana Stretch Corduroy Skinny Pants was an instant hit with Us and we have watched these sell out and be restocked over and over again. Now that they are on sale, it’s a no-brainer to grab a few more pairs. The best part about the design is the fabric blend which is primarily cotton with the perfect touch of spandex for stretchability. They also have a zip fly with a button closure and five pockets for storage. We will be putting these corduroys into our style rotation just as frequently as our skinny jeans since this material — especially the navy version which easily takes on the look of our favorite dark blue denim jeans — can be tucked into our fall boots just as easily. 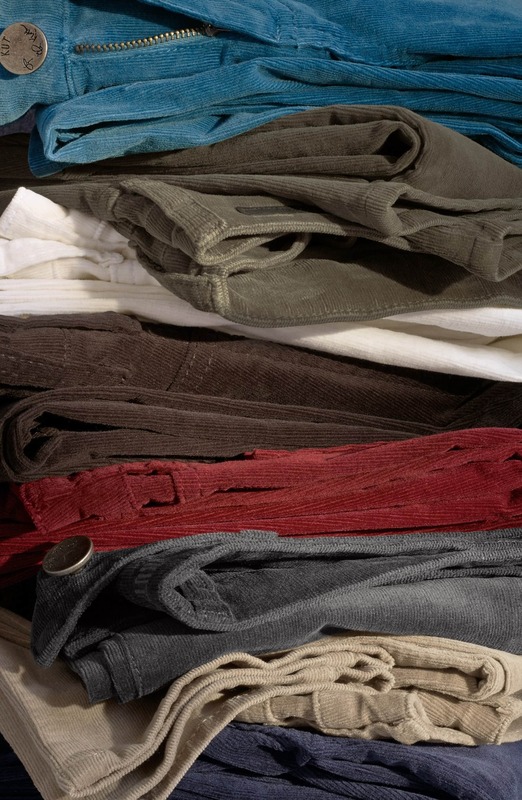 We also adore that these corduroy pants come in such a wide array of colors. There are 10 shades to choose from which include red, wine, brown, blue and green. The wine version is certainly tagging along with Us to the holiday parties on our calendars this season. 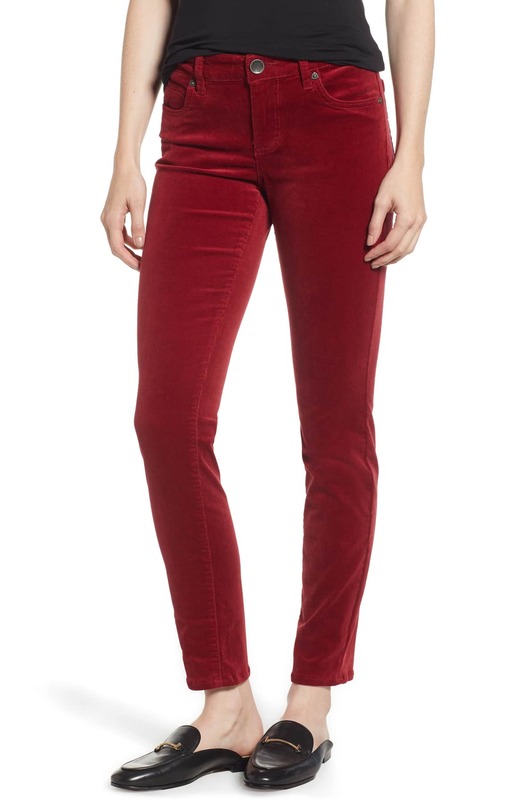 These pants just look so festive in this shade! 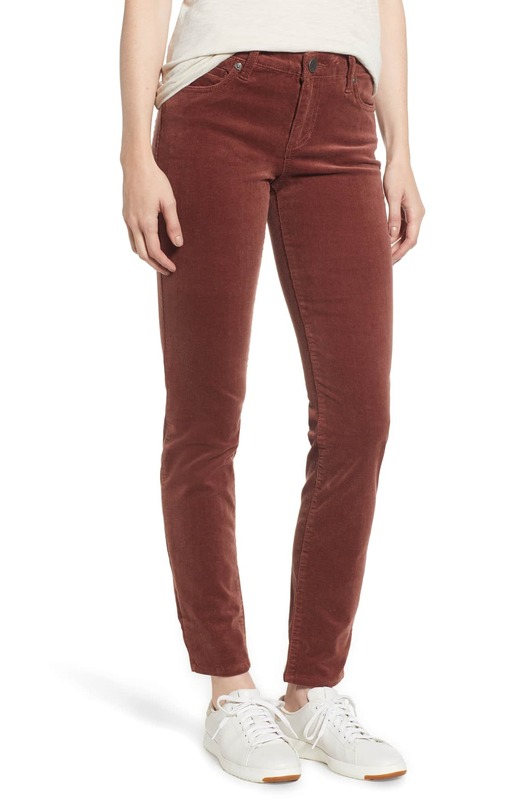 All we need for corduroy skinny pants in this color is a fun embellished sweater and ankle booties or flats. These corduroys have such a flexible style and can be worn to work, parties, for date nights or for casual daytime outings. We will be pairing this light brown version with a cashmere sweater, boyfriend blazer and a mule heel for a look we can wear from the office straight to our favorite happy hour spot for cocktails. It’s also easy to wear these pants with a variety of other textures since they will look great with everything from faux fur to fleece outerwear picks. Whenever we want to step away from the traditional black or blue skinny trousers but still need to keep it neutral, the gray pants are such a chic and convenient pick. We will be wearing the gray design with a pink oversized cable knit sweater with low-top sneakers and one of our favorite sleek cross-body bags! The pants could also be worn with a blouse, our convertible cardigan and ankle boots. Shoppers who own these pants rave about how comfortable they are because of their stretch but also because of how soft the fabric blend is. They love how snugly the trousers fit and flatter their curves without feeling awkwardly skintight. Reviewers wore them for work and for more casual settings. People who have worn their corduroy skinnies for a while were most impressed by how well the pants repeatedly held up in a wash cycle. These are obviously trousers that are cute and made to last! Both Nordstrom and shoppers shared that the corduroys run large so it is important to eye the size chart carefully and order one size down to get the most accurate skinny pants fit. They are also available in regular and petite sizes which both range from 00 to 18. Sizes are available based on color and speedily flying off of the racks so we are going to have to jump on this sale before these cool corduroys go back to full price. We are super excited to wear corduroys specifically by the Kut from the Kloth brand since it is known for churning out quality designs meant for a contemporary woman. Kut from the Kloth also creates staple closet items that are always on trend so we can expect to get lots of wear out of its designs. Make some room in those closets and ready those carts! It’s time to stock up on corduroy for the fall and winter and maybe even get a few friends on the textured pants train as well.